​Janie earned at BA from the University of Oklahoma and a MA from the University of Mississippi in Speech/Language Pathology. Her careers in Speech/Language Pathology, Real Estate, Mortgage Lending, and Private Banking led to involvement with the Germantown Area Chamber of Commerce as a volunteer. In 2013, she was elected as the Executive Director and now serves as President/CEO. Under Janie’s leadership, membership sales have consistently increased. She believes her ability to form personal connections has helped her be successful and allowed the Chamber to thrive under her direction. ​Janie is passionate about the City of Germantown, her Dachshund named Harley and her Corgi named Cassady, and the University of Oklahoma Sooners. Check out her Sooners replica National Championship ring next time you visit the Chamber office. It was apparent at an early age that Kristi had a future in Communication. Although a good student, she always had marks on her report card for “talks too much in class.” Perhaps not a good thing during long-division, however it has been instrumental in her success. Throughout her career, Kristi has used her communication skills to inform, educate and influence in a wide range of industries -- from television to health care to municipal government. And her goal has always been simple, give the facts with flair. She thoroughly enjoys her position of Vice-President of the Germantown Chamber of Commerce, building business relations in the Germantown community and the mid-south region. With a BA in Communication from the University of Memphis, it is not surprising Kristi is a big Memphis Tiger fan. Family relations also require her support of the University of Tennessee Volunteers and the University of Missouri Tigers. When she isn't at work, you will find her laughing with friends, family and her fluffy white dog, Luna. Kayla brings seven years of customer service experience to her role as Program Director of the Germantown Area Chamber of Commerce. While working in catering sales and management in 2016, she became an Ambassador for the Chamber. After being involved for one short year, she found a passion for meeting new people and has been determined to make a career out of bringing people together ever since. 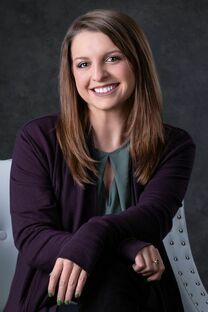 A graduate of Bartlett High School, she is responsible for creating and managing a variety of Chamber events with the goal of helping organizations and individuals in the business community build strong and lasting relationships. Whether leading a group of Chamber Ambassadors in a monthly meeting or planning the Chamber's next big event, Kayla brings joy and determination to everything she does. In her free time, you can find Kayla running at the dog park with her Australian Shepherd, learning about anything that has to do with health and wellness, laughing with friends, or locked in her craft room for hours on end.